Karl Donitz [1891 1980] was a German Naval Commander during World War II, who attained the rank of Grand Admiral and was appointed as Commander in Chief of all submarines. He is also credited with implementing the submarine tactic Rudeltaktik, commonly called wolf pack. On April 30, 1945, in accordance with Hitler's last will and testament he was named President of Germany and Commander of all German Forces. On May 6, 1945, he ordered the surrender of all German forces thus ending World War II in Europe. After the war he was found guilty''crimes against peace'' at the Nuremberg Trials and was sentenced to ten years in prison and was released in 1956. 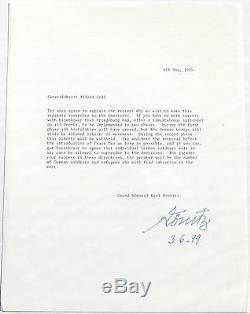 The letter is a typed souvenir transcript addressed to General Alfred Jodi and dated 6th May, 1945. The letter is a typed transcript of the original sent by Donetiz to Jodi and references attempts at facilitating the surrender of German forces to the Americans. The letter is nicely signed''Donitz'' and dated''3.6.79'' in blue fountain pen. The letter measures 8.50 x 11.00 inches and is in fine condition. 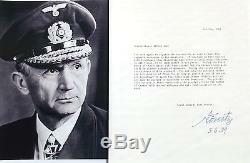 The autograph is authentic, hand signed and the letter is a desirable example of this promient World War II German commander and is ideal for display. We have a nice collection of military, aviation, explorers, political and astronaut autographs. Check out my other items. All our autographs are researched and guaranteed authentic without time limits and will be accompanied with our certificate of authenticity. Be sure to add me to your favorites list. 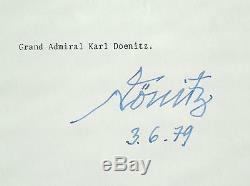 The item "Karl Donitz German Naval Commander WW II Signed Autograph Typed Transcript" is in sale since Thursday, August 17, 2017.